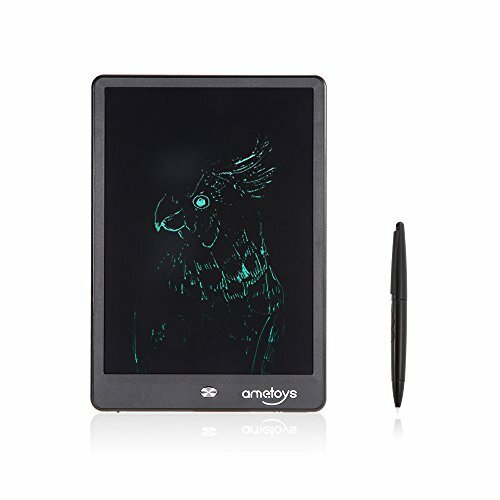 The Ametoys 10 inch writing tablet is perfectly suitable for designer, business man, teacher, students and artist. Say Goodbye to Paper! 2 years worry-free warranty and friendly customer service if you have any problems and questions, please feel free contact us. One Touch Clear: Erase your image or words with the touch of a button - and a friendly flash from the liquid crystal display. Easy To Use : Erase the handwriting with the press of the button and mark down your ideas or memos with the easy-use pen. Ultra Thin Design: With 10-inch LED writing area,only 0.2-inch thickness, slim, it is easy to carry for your briefcase ,daypack ,purse and luggage. High-Tech: The tablet ,made of durable plastic materials and adopted the pressure-sensitive LCD writing surface, is reliable to use. Environmentally Beneficial:Writing or drawing with the included plastic stylus or any other suitable instrument - even your finger! You'll never need to search for a pen or pencil again. And you can save 1000 pcs paper every year! If you have any questions about this product by Ametoys, contact us by completing and submitting the form below. If you are looking for a specif part number, please include it with your message.